Since all Jedi need to build their own lightsabers, why not do it with a little help from ThinkGeek with the Star Wars DIY Force FX Lightsaber Kit? This Saber Kit is just what you need to build your custom saber. 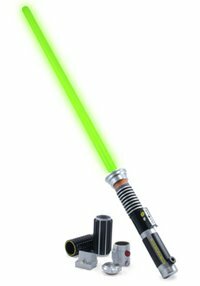 One main saber unit with a tri-color blade (flip a switch and choose red, green, or blue – each with corresponding and different sound effects) and a slew of parts let you assemble the saber you’ve dreamed of. All the parts are based on actual screen-seen components, so your saber will look like an awesome mashup from the movies. And the coolest part is, you don’t have to choose between the Jedi and the Sith – because you can switch back and forth with the flip of a…well, switch. It retails for $99.99 – fair trade for that cool factor whenever you watch Star Wars for the umpteenth time.